Looking at the history of action figures over the last 50 years, there isn't a single style of figure that's as widely recognized and loved as the Lego minifigure. The diminutive blocky yellow figures have captured the imagination of kids for the last 35 years, and still have the action figure community's interest today. Their allure probably lies in their simplicity. They are composed of nothing more than legs, a torso, a head, and typically hair or headgear of some sort... but those four basic combinations can be arranged into approximately 864,993,504,100 unique figures based on parts currently available! That's almost 865 billion different figures, and that doesn't even account for swapping out hands, arms, or accessories. So it's not too surprising that Lego minifigures are such an integral part of the action figure industry. Even in an age when advanced sculpts and diverse articulation is the norm, Lego minifigures remain popular among children and collectors alike. There's something about the classic and iconic design that captures the hearts of people all over the world. Let's take a look at the path the little yellow figures took to get to this point. In their earliest iterations, Lego minifigures weren't action figures at all. They were much more like the building bricks Lego was famous for, just three non-articulating pieces stacked on top of one another that happened to be in the shape of a person. These precursors didn't even have facial expressions painted on their heads, and the only real sense of character they provided was in the different hats they could wear. It wasn't until 1978 when the Lego minifigure as it's known today entered the market. That classic minifigure design originated in the imagination of Jens Nygaard Knudsen, a designer who had been working with the Lego Group for a decade before the minifigure came to mind. The Lego world was full of buildings, cars, and landscapes that never had characters to experience them. Nygaard Knudsen realized that Lego worlds should exist with characters to inhabit them, and he began to formulate the Lego minfigure. After more than 50 attempts at refining and perfecting the minifigure, Nygaard Knudsen had arrived at a design that melded the block world of Lego bricks with the human side of interaction. His figures had hands to grasp Lego accessories, feet that could be firmly planted on every brick, and arms and legs that could move and be posed alongside the unlimited building options Lego bricks provided. He had created the Lego minifigure, the most popular action figure of all time. It was 1978 and Lego Set 600 first introduced the minifigure to the world. The now-classic set included an unassuming police officer with a constant smiling face and a rudimentary police car. It doesn't look like much compared to the complex and interactive Lego sets of today, but it changed the very face of the Lego Group and established their years of continued success. The police officer was closely followed over the next few years by rudimentary minifigures in the Town, Space, and Castle sets. Lego minifigures continued relatively unchanged for another decade. It wasn't until Lego Pirates was introduced in 1989 that minifigures saw their first major overhaul. Lego introduced new face designs that moved beyond the basic smiley face. Suddenly minifigures had beards, eye patches, and more expressive mouths. Minifigures, much like the sets they belonged to, were becoming more complex and dynamic. With the introduction of more advanced action figure sculpts and features in the '80s, Lego felt the need to up the ante with their standard minifigure design. This trend has only been magnified through the years, and it's hard to find two identical minifigure heads on shelves today. Not only did minifigures get a face lift in 1989, but they had some body work done as well. The Lego Pirates theme included changes to the standard body of the minifigure, replacing hands with pirate hooks and legs with wooden pegs. These physical variations served to make minifigures more visually unique and eye-catching. Throughout the '90s, the Lego Group created even more distinct minifigure variations. The first of these specialized figures was the Castle theme ghost in 1990 and next up after that was the minifigure skeleton in 1995. Some collectors hesitate to call these specialized figures minifigures, but their similar size and inclusion in standard sets suggests they fit under that classification. The next big change for the Lego minifigure came in 1999 with the first licensed Lego sets. 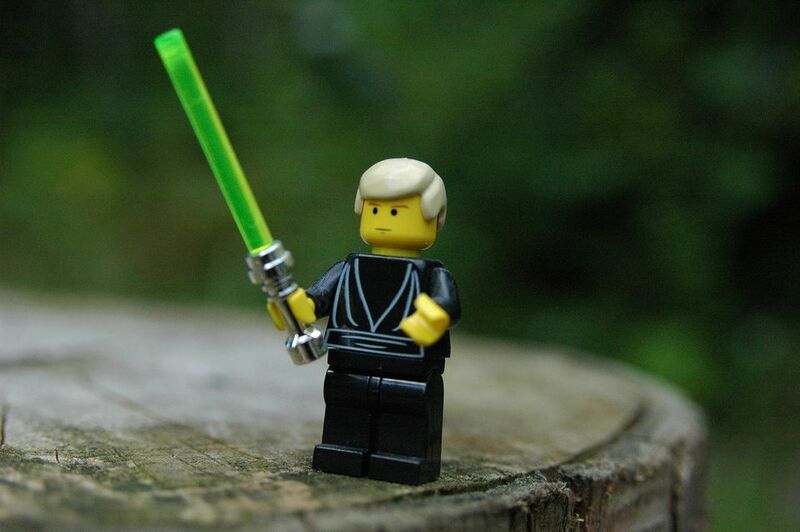 The acquisition of the Star Wars license enabled Lego to produce the first licensed Lego figure, Luke Skywalker. At this point, licensed minifigures were still the standard yellow color. It wasn't until 2003 that Lego introduced variations in skin tone for their classic figures, a move still questioned by some diehard fans. The '00s provided for a flurry of changes and innovations to the Lego minifigure as the Lego Group adjusted to a changing action figure market and children's entertainment landscape. Minifigures with shorter legs, electrical elements, sculpted heads, and loads of different parts all started finding their way into Lego sets. Most of these changes have led to minifigures being more interactive and visually dynamic in order to keep pace with other toys. Lego minifigures even entered the digital realm in television shows and video games as well. The Lego minifigure became even more interesting to action figure collectors in 2010 with the introduction of the Lego Minifigures line. In this line, minifigures were released individually instead of being packaged with cumbersome sets. This allowed collectors to invest in just the figures without acquiring excessive amounts of undesired Lego bricks. The minifigure has had a long history and may have an even longer future. Nothing seems to affect the charm these classic figures convey to children, adults, and the Lego community at large. They may be small in stature, but they've had a major influence on the toy and action figure industry over the last 35 years.